Who loves polka dots? I do! This blouse gives your classic black and white look a playful feel. Depending on your style you can wear it a few different ways as I've shown you above. Whether you need to be professional and have it tucked in for work, worn untucked for a casual day or give it a front tie for a fun get together you have plenty of versatility with one top. How do you see yourself wearing it? 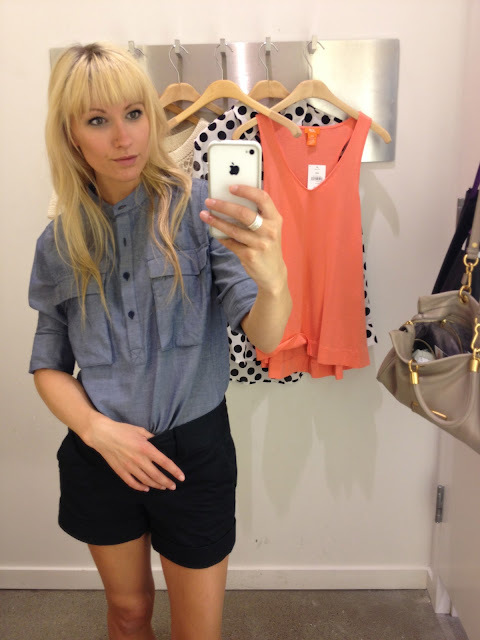 I'm currently into pretty much all things denim right now which explains why I was struck by this top. Since denim is usually a more casual look this top is an exception. This top just appears to be denim when in fact it's not and can get away with looking more like a blouse which also gives versatility between work and fun for wear. This was definitely my favourite pick for the day. I just love casual knits and you can never go wrong with stripes for summer! This sweater is so amazing because when thrown on with a pair of shorts or jeans with little thought it's a look that will appear relaxed yet polished. This is your perfect summer evening piece. Another knit I just couldn't resist! This top is still casual but like the previous one this can be a bit more dressed up with some statement earrings and bracelets if you wish. Keep your overall look clean and simple just like the feel of the top.